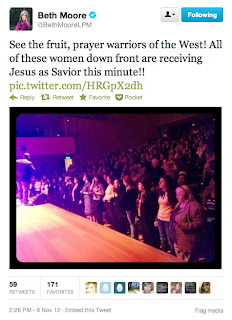 Yet, knowing what we do about some of these speakers, one is left wondering just what was taught to this large gathering of women. Just what type of change did they learn to be? Moore has been discussed at length here and at other reputable online apologetic and discernment sites such as Apprising Ministries. 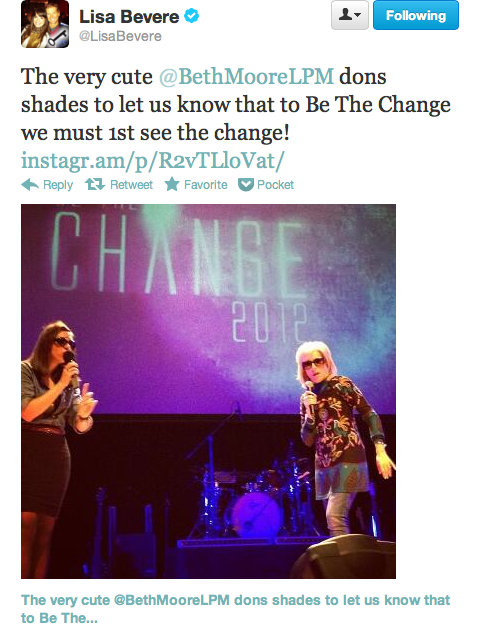 Not only is her participation in the Passion 2012 conference whereinshe and others engaged in a type of “Lectio Divina-lite” concerning, but it has been demonstrated in the past that Moore has seemingly endorsed contemplative practices and other dangerous resources such as the book, Jesus Calling. We got a lot of things going in our current religious culture. And we’ve got two extremes I want to address tonight so that we can understand them. First of all I want you to look over to this side. We have the religious culture of the extreme that I’m going to call Cessationism. Now I’m making up a word with that -ism. But you know the word cessation and it a word that comes from cease. And this particular extreme teaching in the Body of Christ says all miracles have ceased. 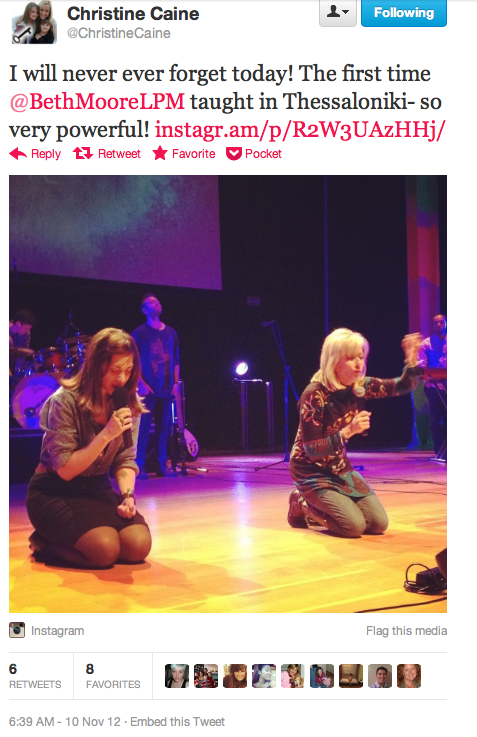 For all practical purposes, God no longer works miracles in our day. Now most of them still believe that He will in the end of times. But most of their stands, and I need to tell you something, I have served all over this spectrum. And I have very good friends and people I love very, very much who stand exactly right here. This was much of my early teaching. In so many ways, much of what they taught me I still live on every single day of my life. It is truth to me that there is one place where it goes that I cannot go with it and that is to the extreme of miracles have ceased. That’s what we’re calling for our practical purposes, Cessationism. to beg to differ with people that are ten times smarter than I am. But I want to say to you I see something different than that. 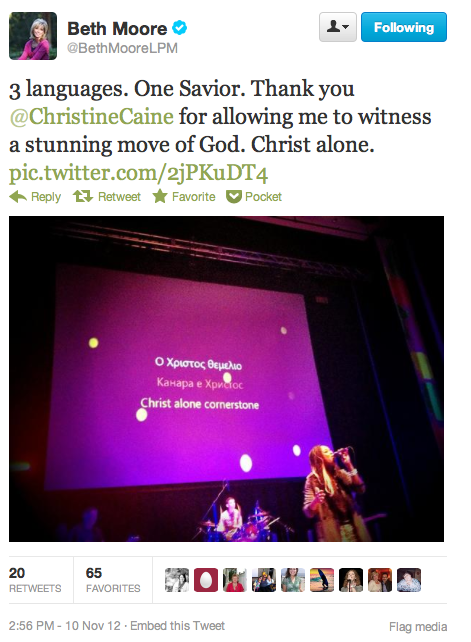 I see God doing something huge in the body of Christ. I do not know why I have had the privilege to get to travel around, see one church after another…one group of believers after another, interdenominationally, all over this country, but I have gotten to see something that I think is huge. Note that Moore above claimed that she had been shown the church “as Jesus sees it.” What is additionally disturbing, then is that Moore apparently thinks that God has shown her that the apostate Roman Catholic Church is part of the true Church. It seems highly unlikely that God would contradict Himself and include within the true Body of Christ a church that teaches a false gospel of works righteousness. Thus, Moore’s claims of visions and revelation must be deemed as misunderstood and/or false. Like Beth Moore, Christine Caine has been discussed at length on this blog and others. 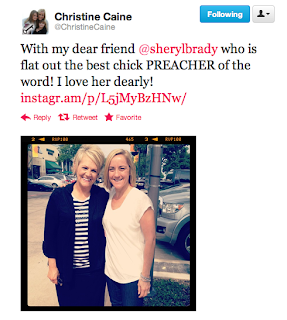 We recently wondered if perhaps God is telling Christine Caine secrets that she is not to share with others. 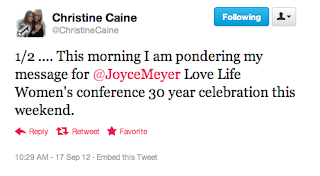 It also has been demonstrated that Caine has apparent disregard for the biblical admonition against women preachers, as she has joyfully taught weekend services at such megachurches as Steven Furtick’s Elevation Church and, most recently, Rick Warren’s Saddleback Church in California. 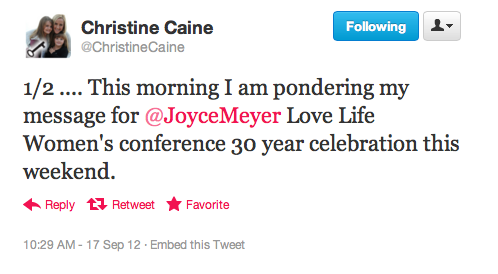 Joyce Meyer teaches such common Word Faith doctrines as the power of words and the idea that men are “little gods.” Her influence over Christine Caine, then, is concerning at best if not demonstrably dangerous. 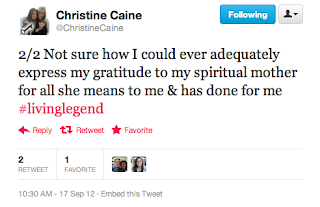 Indeed, as apologist Chris Rosebrough has revealed through a critique of Caine’s Code Orange Revival sermon, Christine Caine is a woman who is adept at mishandling the Word of God. 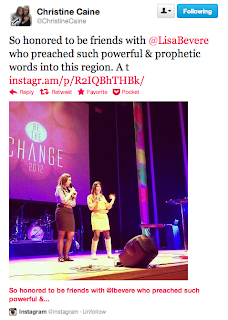 What, then, of the third mentioned Be the Change speaker, Lisa Bevere? Little has been said on this site of Bevere and her husband, John. It was noted, however, that John Bevere was a featured speaker, along with young megachurch pastor Steven Furtick, at the Presence Conference held earlier this year, and hosted by Phil Pringle of C3 Church in Australia. It’s your time. It’s time for the gift of God in your life to come forth. It’s time for the things that you have in your life to be released. Father, I speak to the gifts. I speak to the talents. I speak to the anointing. I speak to what you have given them to steward. I speak release. I bless these hands, Father, with the power of dominion. Dominion? What does Lisa Bevere mean when she says this? Perhaps this clip will help us to understand. Verse 10 states THE most blessed truth, no truth more wondrous, more beneficial than this one. This is at the very heart of the existence of the universe. God actually created the universe so that in the universe He could create the Earth so that on the earth He could create the human race so that out of the human race He could seek and save lost sinners…this for His own everlasting joy and glory. This is what it’s all about. What’s going on on Earth is not incidental in the infinity of this universe, it is the focal point of this entire universe. It is true that the vast and infinite heavens declare the glory of God and the rest of the creation shows His handiwork, and that all together collectively it manifests His mighty power and Godhead. So when you ask the question, “Why is the universe here? And why is the Earth here? And why is the human race here?” The answer is so that God might for His own eternal joy and glory seek and save lost sinners. 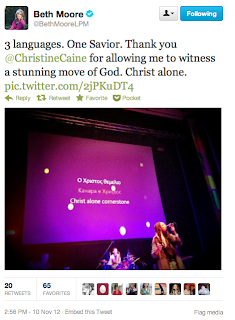 This again reminds us that God is by nature a saving God. Later in this same sermon, Bevere claims to receive a message directly from the Holy Spirit. Divine, personal prophecy? 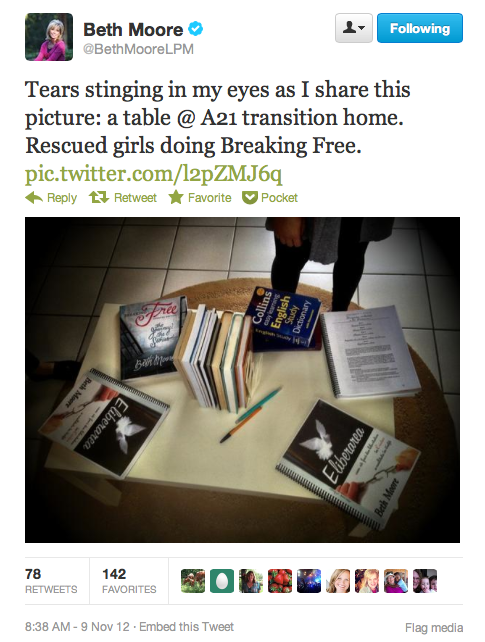 It seems as though Lisa Bevere’s Bible may not end with Revelation 22:21. Prophetic words? Divine, extrabiblical revelation? We can only wonder. It actually grieves us to realize that the question must be asked: which Jesus did they receive?